Smith's Cove, close to George Town Harbour is a popular spot for both local and cruise weddings. 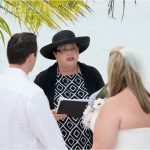 I just received these pictures from a local couple whose wedding I officiated on 8th August, 2008. If I don't give you your Marriage Ceremony on the day, I will be happy to send it for you. Since I put a lot of thought into your ceremony, I always appreciate that you want to keep it as a souvenir of this important day. "I give you this ring, as a token and pledge of my constant love and fidelity." 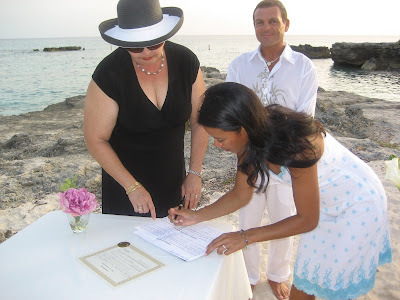 Signing the official documents which make your marriage legal. I keep one copy on my Marriage Book, and file the duplicate with our public records office, after which you can collect, or I will send it to you. Your official Marriage Certificate... is called the Registered Marriage Certificate. This Certified Marriage Certificate is yours to keep as a record of your wedding day. It has your signatures, your witnesses signatures, and my signature and stamp. 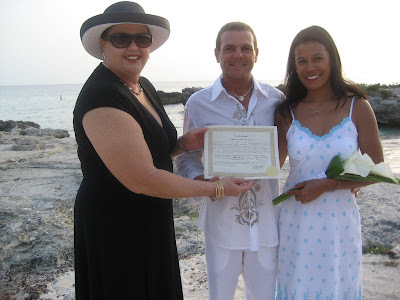 This shows that you have had an authentic marriage in the Cayman Islands. 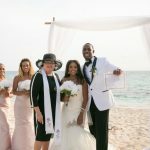 However, your Registered Marriage certificate which has the Cayman Islands Crest as a watermark, and the raised seal of the Registrar General is the document you will need to change your drivers license to reflect your married name, get a new passport etc. The little flower-girl, no doubt dreaming of her own big day, years in the future but of interest to most little girls! 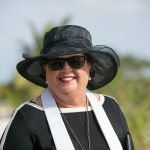 Caymanians and residents have a different process to go through if they wish to be married. They must fill out a form called Notice of Marriage, which needs to be signed and witnessed by someone in their town who has known them for more than 2 years. Then once I have interviewed them I will put up their Banns of Marriage. The Banns have to be posted for 8 days before the marriage can take place. People say to me all the time. "I am on a work permit, what do I have to do to be married?" 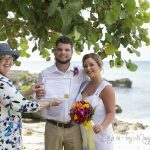 Once you are legally resident in the Cayman Islands and have lived here for more than 15 days then you must be married by Banns. Call me at (345) 5256551 and request an information package which I will send to you by email. Banns of Marriage are good for 3 months. Because most residents get married on Saturday, my Saturdays fill up fast, so book early. I do a very limited number of weddings on Sunday, and have two Sunday slots...10am and 5pm. Sunday weddings attract a supplementary charge.